While infrastructure is an integral part of a developing economy, transport plays a critical role in maximising the utility and the investment made on the roads. The constant concerns of safety, efficiency and performance are addressed periodically by companies like us. It is critical for responsible transport companies to keep evolving their product offerings, keeping in mind the changing user needs. We at MTB, are in the constant endeavour to innovate & inspire the transport business. Constant research and implementation to increase safety, fuel efficiency and performance at large help us evolve better products each day. Two such products were on display at the 4th SIAM Bus and the Special Vehicle Expo. The vehicles were the Tourister COSMO – LWB Version and COSMO School Bus – BS IV Version. 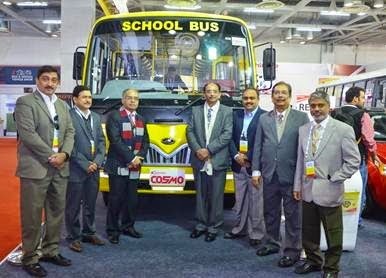 With this expo, the COSMO School Bus – BS IV Version has been unveiled to the customers. These vehicles not only come with enhanced focus on fuel efficiency & safety, but also with good looking exterior and ergonomic designs. The product we believe would be the perfect match for your business needs. The event was held at the India Expo Mart, Greater Noida, Delhi- NCR, India from the 15th to the 17th of January, 2015. Our stall was inaugurated by Mr. Ambuj Sharma, Additional Secretary, Ministry of Heavy Industries, along with Mr. Vishnu Mathur, Director General, SIAM & Mr. Sugato Sen, Deputy Director General- SIAM. 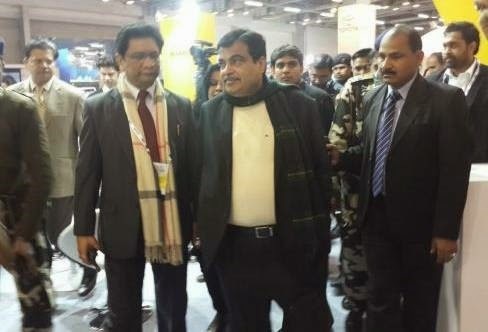 The Mahindra stall was also visited by Union Transport Minister Mr. Nitin Gadkari & Mr. Sajnay Bandhopadhyaya- Joint Secretary of Road Ministry Transport & Highways along with many other bureaucrats from Ministry of Road Transport & Highways.